Pancakes are one of the most well-loved foods for starting the day, particularly due to its high carbohydrate content, which energizes your body. For active people like you, Scitec Nutrition has come up with the perfect pancake, loaded with high amounts of protein, which contributes to muscle growth and development... Say good morning to the delicious Protein Pancake! Each scoop of Protein Pancake gives you 13 grams of protein that will promote lean muscle development and maintenance. You also get 17 grams of carbohydrates, which will keep your body full of energy all throughout the day. With its rich protein content, the Protein Pancake does not just make an excellent breakfast – you can even take some for work, at school, or at the gym for extra protein nourishment! 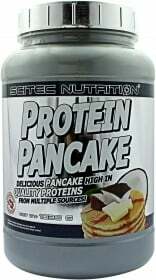 Increase your protein intake and satisfy your energy needs at the same time with a fluffy and rich-tasting Protein Pancake from Scitec Nutrition! Have a question about Protein Pancake? What is it, what does it do, how and when to use or something else? Ask us. “Protein Pancake 37g” is currently out of stock. Enter your details below and we will let you know when it's back in stock. ALLERGEN INFORMATION: Contains egg, milk, and soy.,Contains Gluten,Manufactured in a facility that processes milk, egg, gluten, soy, peanuts, nuts, celery, fish and crustacean ingredients. Mix 37g (1 scoop) with approximately 1/2 scoop of skim milk or water. Shake or mix vigorously until it resembles conventional pancake batter. Pour it into a non-stick pan and fry on medium heat (180-200°C) until it gets golden brown color on both sides (1-2 minutes for each side, depending on the thickness of the batter). Experiment with the thickness of the batter, the size of the pancakes and frying times to make the exact pancake you prefer. WARNINGS Protein Pancake : Use this product as part of a healthy, balanced diet, not as a substitute for such. Keep out of reach of children. These statements have been scientifically proven by the European Food Safety Authority (EFSA) and authorized by the European Commission (EC).